Note: images do not reflect the contents of Dark Command's Blu Ray edition. 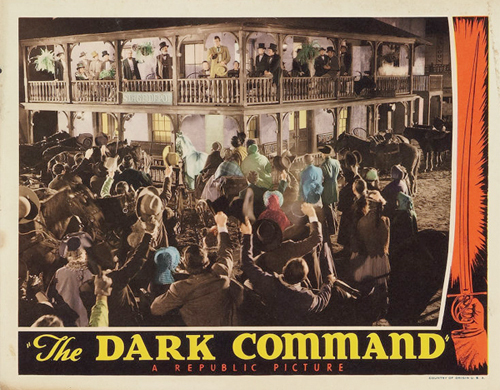 For a John Wayne flick that this reviewer never heard of before Olive Films reissued it, Dark Command came as a pleasant surprise. The rousing 1940 Western appears to have been Republic Pictures' response to Wayne's breakthrough in the previous year's Stagecoach. Here, he plays the same understated yet commanding type from the previous film, re-teamed with actress Claire Trevor as another salty-tongued, independent woman. Dark Command differs from that earlier project, however, in just about every other way. In this Civil War-era actioner, Wayne and Trevor come up against Walter Pidgeon as a decent fellow-turned-guerrilla Confederate leader who proceeds to plunder, loot and destroy the town of Lawrence, Kansas. The film may play fast and loose with the real-life incident its based on, but Raoul Walsh's peppy direction, an interesting cast, and (unique for Republic) handsome production standards make it an enjoyable ride. To be honest Dark Command's storyline isn't one of its stronger points, but it's an easy film to be absorbed into from the very start. After the opening credits roll, Wayne's traveling rancher, Bob Seton, arrives in Lawrence with his dentist pal, Doc Grunch (George "Gabby" Hayes, sprightly as ever). Although the duo at first intend to rest a bit and move onward, Seton is immediately smitten with local lass Mary McCloud (Trevor), the free-spirited daughter of the town banker. She's immune to his easygoing charm, however, being already attached to Will Cantrell (Pidgeon), a local schoolteacher who is running for the position of town marshal. Sizing up the competition, Seton decides to run for marshal as well. He underestimates Cantrell, however, a complex man with a tangled past that involves passing off his own mother (Marjorie Main) as a housekeeper. Despite Seton's lack of education and speech-giving skills, he wins over the townspeople and the election. Winning over Mary proves to be more difficult, however, even with the full support of her father (Porter Hall) and brother (Roy Rogers, looking odd sans cowboy hat). Seton also has a lot to work with in his new position, as the town's black families are being abducted in the middle of the night. Crime and rumors spread, and the townspeople panic, demanding refunds on their land loans from the beleaguered bank. Eventually it's revealed as the work of Cantrell and his minions, an ideologue taking advantage of the Kansas territory's loose laws. Seton and his cohorts attempts to keep order in the town while trying to sway Mary from marrying Cantrell, who has assembled an horde of heavily armed guerrilla fighters outfitted in reclaimed Confederate Army uniforms. While Lawrence becomes a flaming inferno full of looting, plundering guerrilla fighters, it's up to the now-captured Seton to restore law and order to this devastated frontier town. In its own popcorn-ready way, Dark Command brings the goods. John Wayne is his usual reliable self, stately yet vulnerable, handling some great rapport with the wonderful, wonderful Claire Trevor. Supporting players Gabby Hayes and Marjorie Main (in one of her pre-Ma Kettle serious turns) add a lot of color, and it's interesting to see Wayne and fellow Western film icon Roy Rogers in a movie together - their only pairing, it turned out. The sole issue I had came with the handling of Cantrell, a character based on real-life Confederate guerrilla leader William Quantrill. As depicted in the film, his motivations seemed vague and his transformation from decent guy to revolutionary fighter came on too quickly to be believable. Walter Pidgeon gamely tries to bring some gravity to this guy, but the character remains too much of a cypher to really take credibly as a villain. 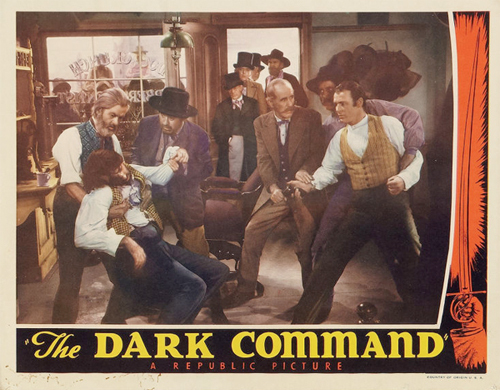 Raoul Walsh directed Dark Command in the midst of some excellent flicks for Warner Bros. - The Roaring Twenties (1939), They Drive By Night (1940), High Sierra (1941), worthwhile light comedy detour The Strawberry Blonde (1941), and the underrated Manpower (1941). While this particular outing doesn't quite reach the heights of the others mentioned, Dark Command is a handsome production that benefits greatly from Walsh's wild and wooly touch. One thing Walsh had over his contemporaries is that he never failed to make his films lively and fun, even when the stories (such as what happens here) become a little too baroque and melodramatic. Olive Films' Blu Ray edition of Dark Command boasts the same nice mastering as their other vintage film reissues, even though the print on this particular release is less well-preserved than the others I've seen. The 1.37:1 picture sports a fair amount of scratches and dust, with one scene riddled with white flecks and a vertical stripe. The picture is decent overall, however, with nice levels of light and dark. The film's mono soundtrack is the only audio here, a decent mix with clear dialogue that never gets degraded sounding to any noticeable degree. No subtitles are present on this release. As usual for Olive, none. Fun stuff. 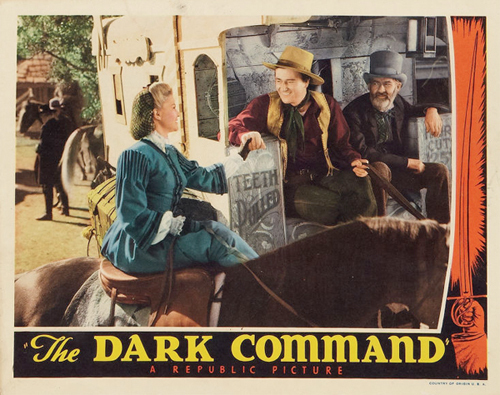 1940's historic adventure Dark Command counts as another of John Wayne's sort-of-a-Western-but-sort-of-not vehicles, with the Duke re-teamed with his Stagecoach co-star Claire Trevor and an interesting cast of pros (including a young Roy Rogers; the only time he and Wayne worked together). In this one, small town marshal Wayne deals with local rabble rouser Walter Pidgeon, who eventually terrorizes the community with a horde of Confederate guerrillas. While the story strains credibility at times, the appealing cast and fast-paced direction of Raoul Walsh make it worthwhile. Recommended.